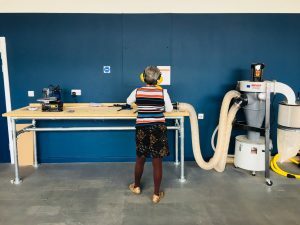 STEAMmates: Meet Bharti Parmar – Artist, STEAMhouse member and local innovator who’s exploring surfaces, materials and new technology. STEAMhouse brings inventors, entrepreneurs and craftspeople together. Our exciting and growing community are sharing skills and knowledge to develop exciting new ideas and products. We’ve caught up with artist and STEAMhouse member, Bharti, to see how STEAMhouse is benefiting regional creatives. 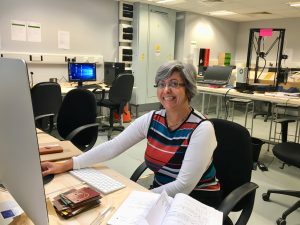 Hi Bharti, thanks for taking the time out of your project to speak with us today, can you tell us a little about yourself and what you are working on? Hello, I’m an artist with a background of exhibiting work for over 25 years. I studied in fine art (printmaking) at the Royal College of Art and have an academic specialism in C19th material culture. Many users of STEAMhouse are designing a product; my work is much more of a discursive exploration of marquetry, craft and veneers. I’m interested in surfaces – and what we expect them to be. What inspired you to focus your energy into this field? I’ve had a lifelong interest in craft, geometry and pattern. Some years ago I heard of the Studiolo Gubbio, a room in a palace in the small town of Gubbio in Italy. I went to visit it – it’s ‘a room within a room’, built entirely out of wood veneer using trompe l’oeil illusion and perspective to make us look again at what we are seeing. I began research in how to use the craft of marquetry and learnt practical skills from the Marquetry Society of GB. I then did a residency at the New Art Gallery Walsall (2014) where I made an installation of panels, artworks and artefacts in the style of a ‘Wunderkammer’ entitled The Marquetarian. So what is it you are looking to achieve? My project at STEAMhouse is about the poetics and mechanics of ‘repair’. I’m interested in celebrating defects in surfaces and in making very subtle interventions in wood. I’m working on a year long project where I’ll be fabricating artworks which uncover blemishes and natural features in materials, e.g. knots in wood, grain in surfaces etc. How wonderful! Can you tell us where or when STEAMhouse came into your thinking? I’m a member of Eastside Projects Associates group ESP, (ExtraSpecialPeople) and Ruth Claxton, Creative Director of STEAMhouse encouraged me to make an application. I booked onto a tour and was hugely impressed with the organisation, facilities and possibilities of what I could achieve. 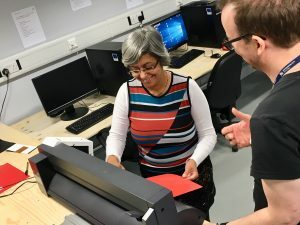 I’d used a FABLAB elsewhere to learn laser cutting and 3D printing – but that was in an educational setting sharing with students. 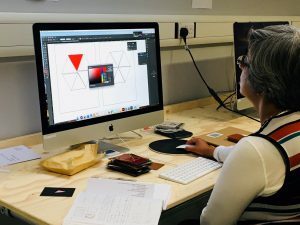 Here at STEAMhouse, we are all professional artists, designers and entrepreneurs and we benefit creatively from working together and sharing ideas informally in the workshops. And what is it you have done with us so far, how did you start your journey with us? I’ve been working at STEAMhouse for a month or so over the summer so it’s early days. I’m learning how to create digital files in order to use the various technology. Without giving too much away, I’m currently exploring several ways to make holes – from laser cutting – to manually using a very fine blade on a scroll saw. What’s next in your STEAMhouse project journey then? I want to learn how to use the CNC cutter! What words of advice would you give to other innovators out there (feel free to give STEAMhouse a shameless plug 🙂 )? Thanks Bharti, we look forward to seeing what unfolds for you and your work. Feeling inspired? Get involved with STEAMhouse by checking out our upcoming events or by registering to join here.